We arrive at TwoRuba in the middle of a torrential downpour – thankfully it’s a short walk from London Bridge station! 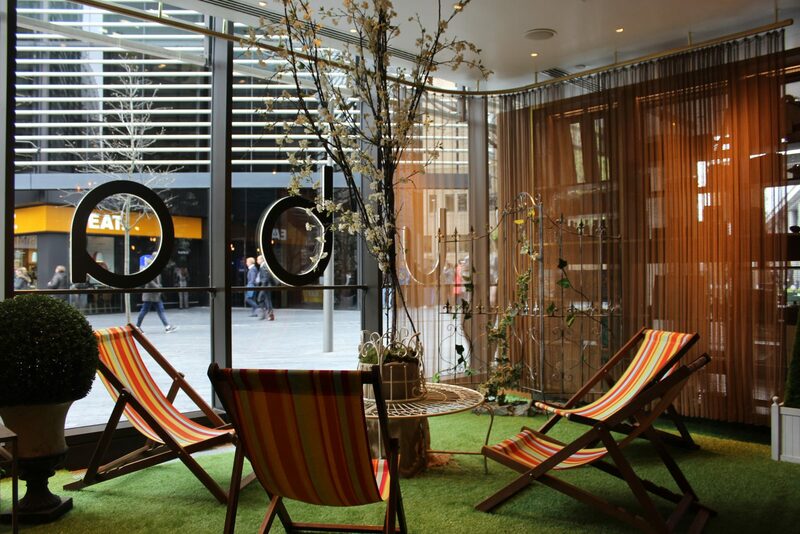 Depending on which entrance you use, you’re either greeted by the cheery front desk staff of the Hilton hotel (the bar is on the premises of the Tower Bridge branch) or a bright scene of grass and picnic chairs for their spring installation! After shaking the rain off, we’re quickly greeted and shown to our seats, where we spend a little too long perusing the extensive drinks menu. 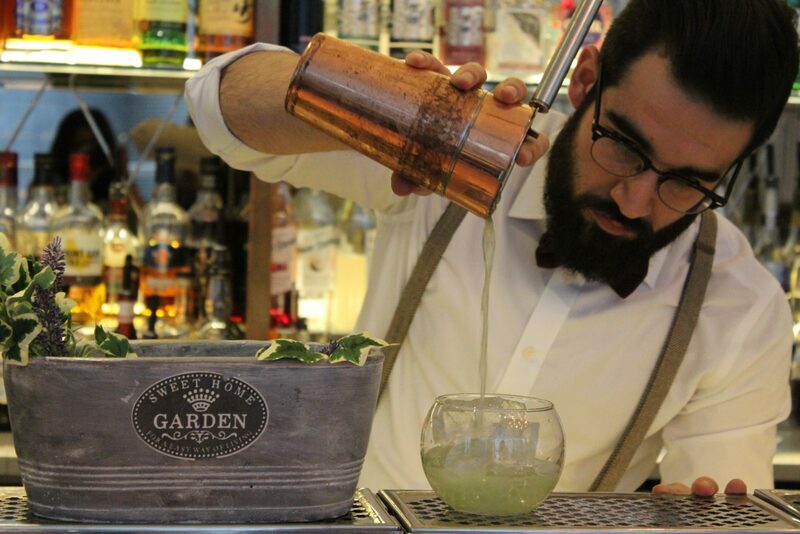 We both opt for something from their Spring Garden to Glass cocktail menu, which was specially created by the TwoRuba mixologists. As one of them explained to me later, each of the four bartenders created their own cocktail for the Spring menu – and had a personal competition to see which one sold best! I went for a TwoRuba Cooler; a refreshing blend of gin, Cointreau, apple, lemon, rose syrup and rosemary, while my companion eventually chose the Raspberry and Thyme smash, which was composed of dark rum, raspberry (of course), thyme (of course), cranberry and lime. Both were served with a flourish, but the Raspberry and Thyme was the real star of the show! Presented in a bird (yep), you release the drink by lifting the bird so it flows out of the straw, and into your glass. Not only does it look pretty nifty, but the bird holds more drink than the glass, so you get a little more alcohol than is strictly fair to your companion! After finishing these alarmingly fast, and having been brought some nibbles by our waitress, we decided it was time for round two! Next up were some espresso martinis, which sharpened our wits long enough for us to think about ordering something to line our stomachs. After a little bit of haggling amongst ourselves, we opted for the margherita arancini and some garlic bread (I firmly believe in the importance of garlic bread being present at every meal). The bar nibbles are courtesy of Jamie’s Italian which is adjacent to the bar, so we weren’t disappointed in our choices! The garlic bread was a perfectly soft and fluffy focaccia, strewn with fresh rosemary, while the arancini were deliciously crispy on the outside and perfectly cheesy and oozy (they’re stuffed with mozzarella) on the inside. The accompanying tomato and basil sauce helped keep it from being too rich, and we inhaled both plates in the space of about 30 seconds. Feeling like we had just about enough sense left to make our way home, we ordered another drink each. I ordered a classic margarita (my ultimate test of a bartender because tequila is my best friend and you need to treat it right), while my companion returned to the Spring Garden to Glass menu one last time to try the Spring Spritz – a blend of blanco tequila (yay! ), St. Germain, lemon, vanilla, and mint. 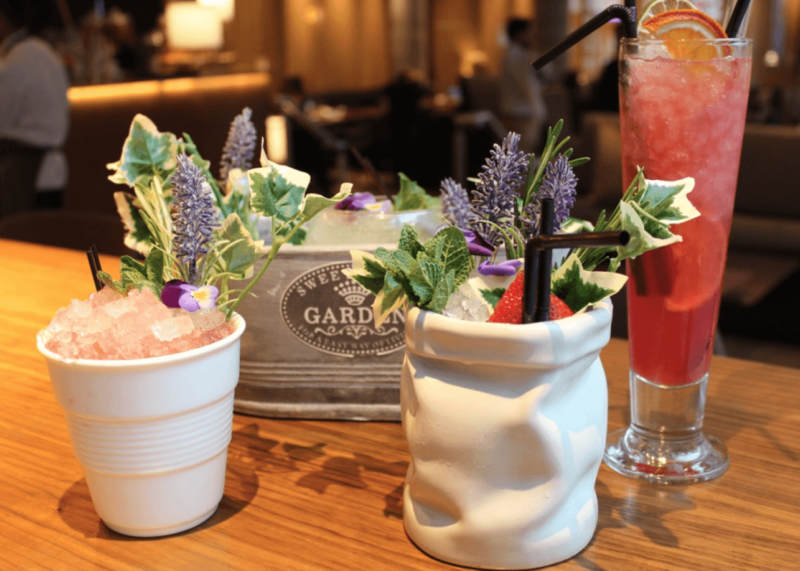 Having had our expectations for flair set with our first round, we were delighted – but not surprised – when the Spritz was presented in a watering can. Upon first sip, my companion looked concerned. I was halfway through my margarita already by this point (they passed my test), so when I eventually noticed and asked him what was wrong, he pointed an accusing finger at the watering can and declared it was FAR too easy to drink, and that I needed to try it immediately before he necked the whole thing. I did, and agreed – it was fantastic, and a bit dangerous for him, so I’d better look after it. After a bit of a tussle he won his drink back, so I had to make do with the remains of my (admittedly great) margarita. Finishing our drinks, and feeling a bit giddy, we wandered/stumbled over to the bar to thank the staff for a wonderful night – and were rewarded with some sneaky shots of espresso martini! This made the prospect of heading into the rainy night that little bit easier to bear, and we merrily (drunkenly) left our new BFFs with the promises of returning soon. It’s a promise we intend to keep!